Kasha-Katuwe Tent Rocks National Monument is a U.S. National Monument located approximately 40 miles southwest of Santa Fe, New Mexico, near Cochiti Pueblo. Managed by the Bureau of Land Management (BLM), it was established as a U.S. National Monument by President Bill Clinton in January 2001. Kasha-Katuwe means "white cliffs" in the Pueblo language Keresan. The monument is a unit of the BLM's National Conservation Lands. 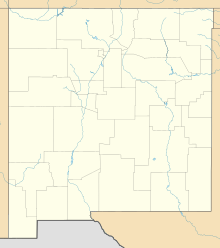 Kasha-Katuwe is located on the Pajarito Plateau between 5700 and 6400 feet (1737–1951 m) above sea level. The area owes its remarkable geology to layers of volcanic rock and ash deposited by pyroclastic flow from eruptions within the volcanic field of the Jemez Mountains that occurred 6 to 7 million years ago. Many of the layers are light in color, which is the origin of the monument's Keresan name. Over time, weathering and erosion of these layers has created slot canyons and tent rocks. The tent rocks are composed of soft pumice and tuff. Most of the tent rocks have a distinctly conical shape and some retain their caprocks of harder stone. The tent rocks vary in height from a few feet to 90 feet. The BLM maintains hiking trails as well as parking and restrooms at the site. The Slot Canyon trail is a one-way trail covering 1.5 miles (2.4 km) through a slot canyon and up a climb of 630 feet (190 m) to a lookout point where the tent rocks may be viewed from above. The Cave Loop trail is approximately 1.2 miles (1.9 km) and leads past the base of the cliffs, near some of the tent rocks and a small cavate similar to those found at the nearby Bandelier National Monument. The Veterans’ Memorial Scenic Overlook, dedicated in 2004, includes a 1 mile (1.6 km) loop trail and views of Peralta Canyon and the Jemez Mountains. The overlook is located at the end of a gravel road approximately 3.5 miles (5.6 km) west of the tent rocks and may not be accessible depending on road and weather conditions. The monument is open for day use only and may be closed by order of the Cochiti Pueblo Tribal Governor. Considerations for hiking include the possibility of flash flooding in the slot canyons and the high altitude of the monument. The monument is closed to dogs. Science fiction TV series Earth 2 filming locations included the monument. ^ "National Monument detail table as of April 2012" (PDF). Bureau of Land Management. Retrieved 2012-12-27. ^ a b c "Kasha-Katuwe Tent Rocks National Monument". Bureau of Land Management. Retrieved September 24, 2018. Wikimedia Commons has media related to Kasha-Katuwe Tent Rocks National Monument. This page was last edited on 25 September 2018, at 10:35 (UTC).